The most contemporary approach to behavioral statistics. 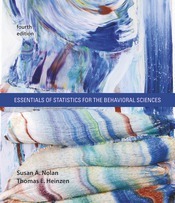 Nolan and Heinzen offer an introduction to the basics of statistics that is uniquely suited for behavioral science students, with coverage anchor to real-world stories, a highly visual approach, helpful mathematical support, and step-by-step examples. The new edition focuses on emerging trends that are redefining contemporary behavioral statistics, while adding an remarkable new online feature, Choosing the Correct Statistical Test, in the book’s online component, LaunchPad.